Today we have a special treat - we feature F. Isabel Campoy & Theresa Howell, co-authors of the award-winning MAYBE SOMETHING BEAUTIFUL: HOW ART TRANSFORMED A NEIGHBORHOOD, illustrated by Rafael López (HMH Books for Young Readers 2016). Isabel: Writing for children is a passion that I have nourished in my heart since I myself was a child. Growing up, I was very close to my brother Diego. We shared friends, outings and trouble. My father gave us once a discarded oversized accounting book and told us “Whatever you write in here, becomes true. 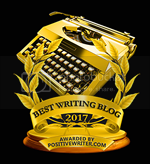 Share these pages.” The notebook was truly amazing, weighed a ton and could only live under a bed because it occupied all the space on any table. Diego would bring it out on Sundays to write about the football matches of that day, the winners and losers and his omens for the following Sunday. He was sure he was the key factor in the national league –thanks to my father’s words. I, however, had the privilege of owning the book the rest of the week to make my dreams come true. I was born in the Mediterranean, in the city of Alicante in Spain. The back of my house led to a desert landscape. I wondered what it would be like to see and experience snow so I wrote my first story about a snow man that hides in a refrigerator. And I had the privilege to be published in a local magazine at the age of eleven. I came to the United States for the first time when I was sixteen, as an American Field Service Exchange student. I lived with a very kind family, the Veverkas. I met in person the President, John F. Kennedy, I mourned his death in Trenton, Michigan on November of 63, and I learned a lot about multicultural differences and respect. As so many people in love with words, I became an editor, just to be close to “book action” and publishing. In Spain, I authored and published books on my specialty, applied linguistics, and when I came to the U.S. for the third time, I came as an editor for the college division of Houghton Mifflin in Boston. I was finally able to change sides at the table of the publishing world in 1995, when I became an author of Harcourt. Since then I have authored and co-authored over a hundred and fifty books for children and I still talk to the child in my heart. Theresa: Ever since I could read, I have had a book in my hand. From second grade on, I filled notebooks with poetry and stories. Still, becoming an author seemed like a distant dream. After grad school I began working as the children’s book editor for Rising Moon/Luna Rising. It was so inspiring to be able to bring new authors’ and illustrators’ ideas to life. Even though I was editing, I was still writing and keeping track of all of my ideas. Over the last few years, I’ve been making the transition from editor to author. Now I act in both roles! It’s fascinating to see the process from both sides. Writing for children is my passion. I love looking at the world through their eyes. 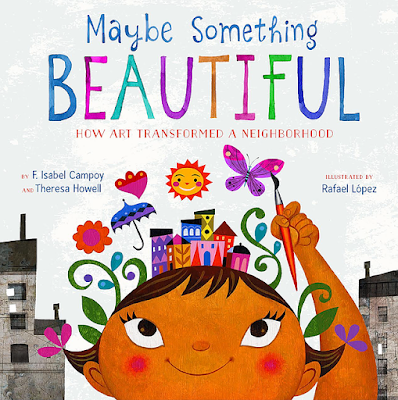 Congrats on your award winning book, MAYBE SOMETHING BEAUTIFUL, illustrated by Rafael Lopez! Tell us about the book and how you came to collaborate on it. Isabel: Theresa is my kindred spirit. We both were editors before we became authors. We both love art. We both share faith in transformation of the world around us towards a better horizon of hope. She knew Rafael and proposed to me the writing of the book. I asked her to co-author it with me. We connected immediately and these have been six beautiful years of collaboration, respect, and joy! Rafael has been an angel added to my life. His sense of humor, his youthful character, his profound knowledge of color and form, texture and design has brought a dimension to my life I didn’t know I could enjoy so much: muralism. I realize I go through cities in this country looking at walls, and discovering the many identities of our “barrios”, our neighborhoods, our cities. 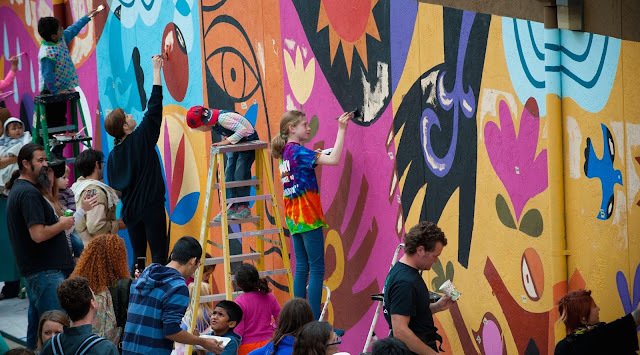 Theresa: Rafael and I worked together on Monica Brown’s book, MY NAME IS CELIA During that time, I learned of the inspiring work he and Candice did in their neighborhood, bringing their community together to paint murals in the places that needed them most. I thought this would make an incredible book for kids to show how important art and community are and how it’s possible to make a difference in the world. Rafael was surprised by the idea, but he was open to it. I had heard Isabel speaking once about the importance of art and I knew she would believe in the book as much as I did. Our team has been wonderful to work with. We all deeply believe in the book and the work we created together. Did you visit any of the murals during the writing of the book? Isabel: Once Theresa and I were in agreement that this was a precious story to tell, we arranged to visit San Diego and be introduced to Rafael and Candice, get acquainted with the murals, and plan our steps forward. My first impression visiting Rafael and Candice’s home was, “What a beautiful house! What incredible design of space! How peaceful it must be to do art in here!” That day we walked the streets where there were elements of the “Urban Art Trail,” we visited murals painted by other artists, and we talked without stop until it was time to return to the airport. It was crucial to see with our own eyes what we were about to describe. Theresa: Isabel and I took a special trip to San Diego to meet with Rafael and Candice once the project was set in motion. They took us all around the Urban Art Trail, telling us personal stories behind the murals, the paintings on the electrical boxes, and the mosaics laid into the sidewalks. 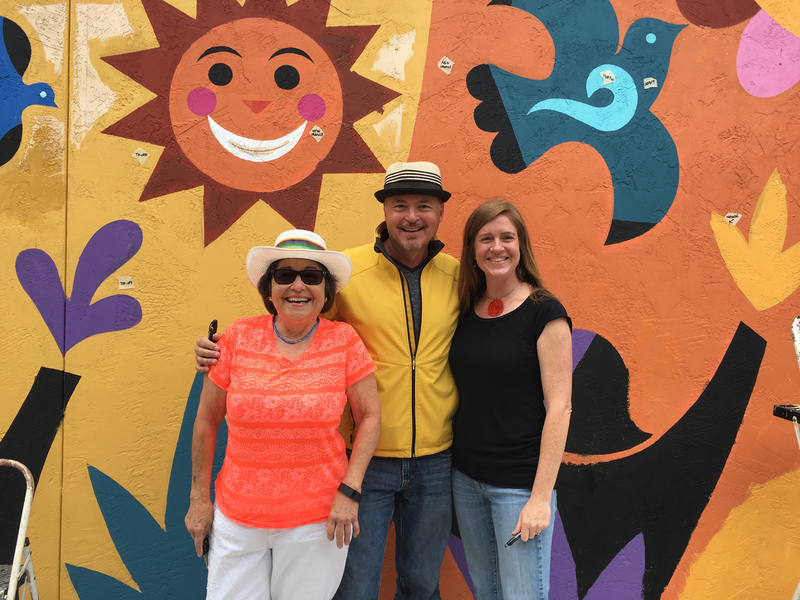 Their neighborhood was alive with art and color. It was very powerful to be in this place alongside the artists that were behind all of the beauty. How is collaborating on a story different than writing one yourself? Isabel: I have had great practice in co-authorship. 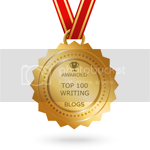 I have written with Alma Flor Ada over one hundred books, and I love the process. I have also enjoyed writing books on my own, it is a very different experience, and I think both are enriching. When writing in co-authorship, the two authors need to appreciate, respect and value each other. They need to plan and draft the book being open to suggestions, corrections, deletions and criticism. It is as if we both put on our hats as authors first, and editors later, and the result is a manuscript that we both feel reflects our ideas and style. Theresa: From my perspective, all books are created in collaboration with others. They are a melding of ideas and talents from the authors to the editors to the illustrators and designers. A truly successful collaboration, which is what I consider our team to have accomplished, relies on mutual respect and trust, and a willingness to be open to new ideas. Isabel: I have been working for quite a while now in a story that it is dear to my heart for several reasons. The main character is from the same town where I was born (although a century and a half earlier), and his vision, to bring to America a most valued medical resource, I think it is worth sharing. There are many heroes buried in the dust of history. He is one of them. In co-authorship with Theresa we have already written our next true story. We are hoping editors will like it as much as we do. Theresa: As always, I have a million ideas floating around in my head. After MAYBE SOMETHING BEAUTIFUL came out I released SCOUT MOORE, JUNIOR RANGER: GRAND CANYON about a little girl who fancies herself the ranger of her own backyard. When her parents take her to Grand Canyon she is absolutely awed and amazed. I’m working on a continuation of her adventure as she and her family travel to the Colorado Plateau and the Utah-region. Isabel and I are working on another project about the power of books and literary. We’re both really excited about that one. Lastly, I’m working on a picture book biography about an incredible woman scientist who life is an inspiration. I’m intrigued by her work and her lifelong love of science and discovery. Isabel: The hardest thing for me is to accommodate the voice of my characters in my mind. Characters have their own personalities, likes, manias, ways to see life, and sometimes they do not coincide with mine. To get to agree in that middle of the way, is like a marriage. Sometimes my character wins, some other times I make my character do what I think is convenient for the story. Yes, I know…crazy, right? Yes, it is a little crazy, but a lot of fun! The easiest is probably to transfer what I imagine into words. Words are most of the time waiting for my command: GO!, and then they are like water falling in cascade down to a valley where the story is created. When I re-read what I wrote in a day’s work I sometimes feel like a guest on the shore of this river. I don’t recognize all sentences, although they make sense to me. What is important throughout the process of creation is peace, quiet, concentration, and faith in your story. Theresa: The hardest part is revising! I have a new appreciation for how all of the authors I’ve edited feel now that I’m on the other side. It takes WORK and patience and trust. It also takes the ability to let go. Not easy. Isabel: Have fun with the process. Don’t write out of need. Enjoy your words. And specially, don’t sit to write a book. Sit to write a paragraph. That’s how books are written. Theresa: Keep writing. Stay positive. Write down of any flickers of inspiration you might find, any ideas for new stories. Stay inspired. Give yourself time to write. Dig in deep and be persistent as you follow your aspirations. Isabel: Probably the fact that I am a terrible painter and an even worse sculptor. But I like to go to my studio and use color in a canvas, or mold mud into a certain shape. I think these two other forms of art are like transforming words into matter…. Blue and green words…. Mud hands that reach for the soul of a story. While I am in my studio I listen to music and sometimes my family has to remind me that is time to turn the light off. Oh, reality! Theresa: Strange as it may sound, I love exploring old cemeteries and imagining the lives of the people buried there. I have a YA novel about just that thing that maybe one day will see the light of day. Please visit my website at theresahowell.com. We have a gorgeous website for our book as well at maybesomethingbeautiful.com. I’m on Facebook as Theresa Howell, Children’s Author, and on Twitter as well. F. Isabel Campoy is the author of numerous children’s books in the areas of poetry, theatre, stories, biographies, and art. As a researcher she has published extensively bringing to the curriculum an awareness of the richness of the Hispanic culture. She is an educator specialized in the area of literacy and home school interaction, topics on which she lecturers nationally. 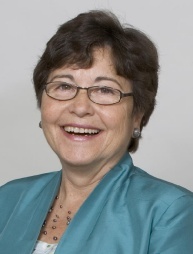 An internationally recognized scholar devoted to the study of language acquisition, a field in which she started publishing in 1973 after obtaining her degree in English Philology from Universidad Complutense in Madrid, Spain; and post graduate work in Reading University in England, and UCLA in the United States. Her many accolades include ALA Notables, the San Francisco Library Award, the Reading the World Award from the University of San Francisco, the NABE Ramón Santiago Award, the International Latino Children’s Book Award, and nine Junior Library Guild selections. She is a member of the North American Academy of Spanish Language. 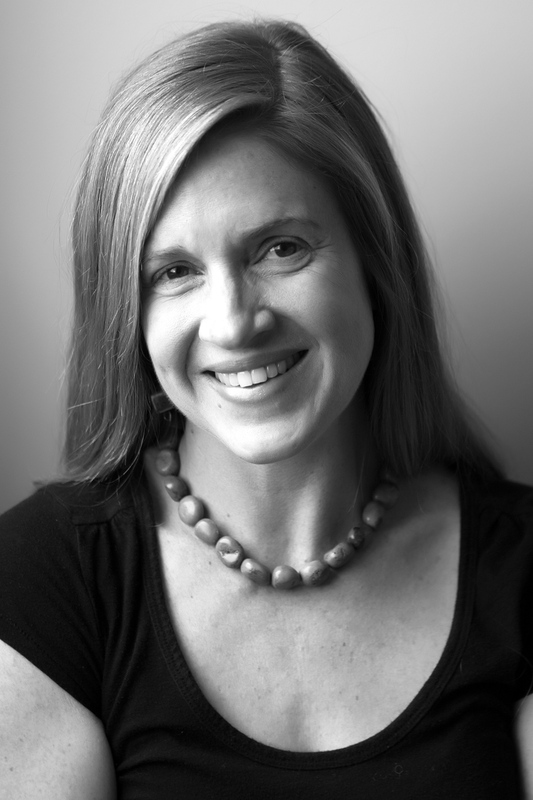 Theresa Howell is a writer, an editor, a mom, a hiker, and a devourer of books. Her fascination with books began at an early age and continues to gain momentum. Today, she reads them, writes them, edits them, teaches them, and carries one around with her wherever she goes. She began her career in publishing as a children’s book editor with Rising Moon, where she helped to establish the bilingual imprint, Luna Rising. She is the editor of numerous award-winning and best-selling children’s books including My Name is Celia: The Life of Celia Cruz by Monica Brown, There Was a Coyote Who Swallowed a Flea by Jennifer Ward, and Do Princesses Wear Hiking Boots? by Carmela LaVigna Coyle. Today, she writes stories of her own and works as an independent children’s book editor. Theresa lives in Colorado with her husband and two daughters where she hikes, reads, dances, and dreams. It's so wonderful to hear more about this book's background and story. Lovely interview. Thanks for sharing your advice too! Go ahead Claire. Start today, here is your prompt..."I never thought..."
Very colorful illustrations! There should be more murals! Thanks for the interview. The illustrations are lively and fun. I love the street art and we have similar art walks near where I live. This sounds wonderful! Thanks for the interview! I loved this amazing interview! Murals are very powerful and I've seen so many on art walks - seascapes and landscapes, those that depict the human condition or the political, cultural murals such as those in N. Ireland. Never underestimate the impact of art and inspiration on fulfilling what seems to be an impossible dream. I certainly learned important ideas from this interview. "Don’t write out of need. Enjoy your words. And specially, don’t sit to write a book. Sit to write a paragraph. That’s how books are written." Thank you for these words! MAYBE SOMETHING BEAUTIFUL is a favorite of mine--- in fact, it's a mentor text for something I'm working on. I enjoyed hearing about your collaborative process! I love learning the backstory of books & this is such an interesting one! Thank you!